4-Years since we started Reaching the Hungry (RtH). 1,100 people mobilized on the mission field. 47 Mission Trips to... Malawi, Mozambique, Kenya, Vanuatu, India, El Salvador, Nicaragua, & Mexico. 28 Outreaches seeing thousands of people come to Christ. In 2014, we showed the Jesus Film to about 10,000 people. 4 Classes: 2 Water Well Installation​ Classes, 1 Church Planting Class, & 1 Eye Glass Fitting Class. 15 Water Wells installed. Saving thousands of lives. The clean water will prevent many deadly contagious diseases and the opportunity to share the good news of Jesus, the Living Water will reach many for eternity! $450,000 Raised. Over 50% went directly to the mission field to help missionaries become self sustaining and for Jesus Film Outreaches, Talking Bibles, & other evangelism tools. Please don't forget RtH in your Year-End giving! Alison (21) just finished finals and returned yesterday from William Jessup University near Sacramento. She is in her last year of her Literature degree with a minor in Bible. She's planning to pursue further education. Olivia (20) enjoyed a semester of Bible school in England and is currently immersed in a full-time ministry internship at our church. In the fall she'll transfer to Life Pacific Bible College to complete her degree in ministry. My Mum, Zina (86) has come to live with us. She is doing well physically, but has started losing her short term memory. My father passed away 16-years ago. Lisa (53) is still tutoring students and keeping our "Reaching the Hungry" books. She's been hiking a lot this year and loves it! She did the Freedom Climb this summer to raise money awareness to combat human trafficking by hiking 7 of the 14-teeners in Colorado in 4-days. 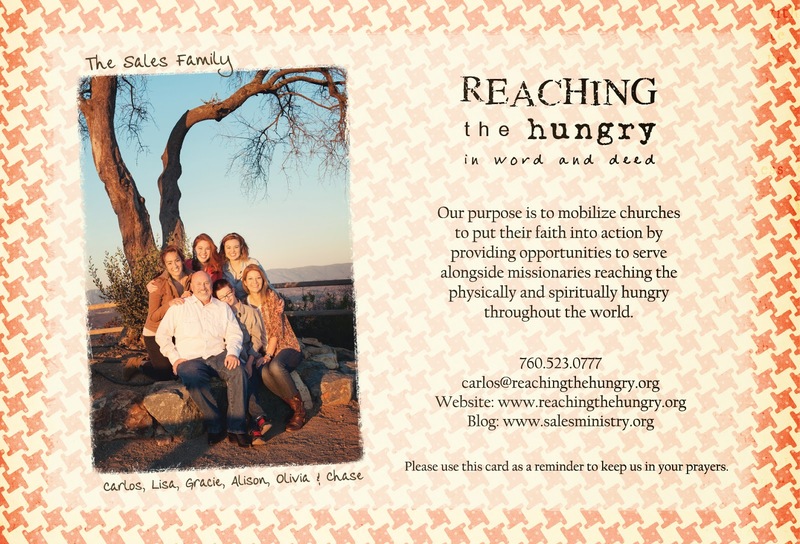 Carlos (54) is still running our 501(c)3 Reaching the Hungry ministry. He led mission's teams to Nicaragua twice, Malawi twice, India once, and Mexico about 8 times all this year! Plus, he officiates lots of weddings to help the girls with their college fees. We are all looking forward to 2015!